Charlie loves the bright red purse that his grandmother let him have. One day, he decides to take it to school. First his father, then his friends, and even the crossing guard question him about his "strange" choice. After all, boys don't carry purses. They point out that they, too, have things they like, but that doesn't mean they go out in public wearing them. But Charlie isn't deterred. Before long, his unselfconscious determination to carry a purse starts to affect those around him. His father puts on his favorite, though unconventional, Hawaiian shirt to go to work; his friend Charlotte paints her face, and the crossing guard wears a pair of sparkly shoes. Thanks to Charlie, everyone around him realizes that it isn't always necessary to conform to societal norms. It's more important to be true to yourself. With its humorous, energetic illustrations, this book is ideal as a read-aloud or as a story for emerging readers. It can also be used as a starting point for a discussion about gender roles. 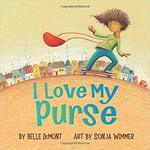 Demont, Belle, "​​I Love My Purse" (2017). DIVerse Families. 1337.